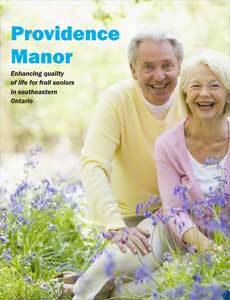 Providence Manor is a long-term care home located in the heart of downtown, Kingston, Ontario. It was founded by the Sisters of Providence of St. Vincent de Paul, who- according to their Mission statement-is an apostolic congregation of vowed women religious who are called upon to be “channels of God’s Providence.” “A heart consecrated to charity,” is the Sisters’ motto. According to Nowlan, “The Sisters worked in the prisons , in the orphanages, with people with disabilities and the vulnerable elderly. They used to go around the city and area to collect donations to feed people.” In fact, within days of their arrival in Kingston from Montreal, the original four Sisters had already taken orphans into their care, visited sick people in their homes and soon began to visit female convicts in the penitentiary. The Sisters’ first home and “House of Providence” was at the corner of Ordnance and Montreal Streets. Ten years after their arrival, their successors began work expanding the House of Providence to provide more space for the ill, elderly and orphans. Over the following years, many new additions were made to the Home. Today, the first House of Providence is known as Providence Manor and provides end-of-life care, and long-term care. Residents come to live at Providence Manor after being assessed by their local CCAC (Community Care Access Centre). Nowlan also talks about the general level of care offered to all Providence Manor residents by its 420-member staff: “Our philosophy of care is very centered on the person; enabling that person to be the best they can be within the limitations they have in life. We call that the ‘restorative care model.’ So, we don’t ‘do’ for people – we assist people to do for themselves. This is their home and they have the right to make decisions that affect their lives. We work very closely with residents and families to understand how they want to live their life while they’re here.” Providence Care’s partnership with Queen’s University and St. Lawrence College means Providence Manor is also a learning site for new healthcare providers, including doctors. Medical residents complete placements at Providence Manor, gaining experience caring for older adults. The move is approximately five years away, and the University Hospitals Kingston Foundation is launching a capital campaign this fall, which will raise money to support Providence Care’s Providence Manor redevelopment project, as well as other hospital projects in southeastern Ontario.